The Garmin Forerunner 410 watch packs many features that appear to take this watch on a sprint to the finish. Is it a worthwhile upgrade from the the 405? Read and decide. Let's discuss the design and build quality firstly. It's crafted from a very durable rubber plastic and the band itself is thick and hard wearing. The latch is made from metal for long jeopardy and metal is also used for the two physical buttons that are located on the right hand side. The display is coated in plastic and appears to be very resilient. The overall design isn't outrageously nasty but it looks dawky and I find myself displeased with my appearance when wearing it in public. Is it comfortable? Yes. Actually it's surprisingly soft and light on the wrist and this makes it perfect for sports and physical activities. Battery life is acceptable with it lasting two weeks in non GPS mode. In trainer mode it lasts for around 8-10 hours. Not to shabby I think and charging is very simple, with a clip supplied that can simply be attached and detached quickly. The user interface tries to represent an intuitive way of functioning the watch to the user. 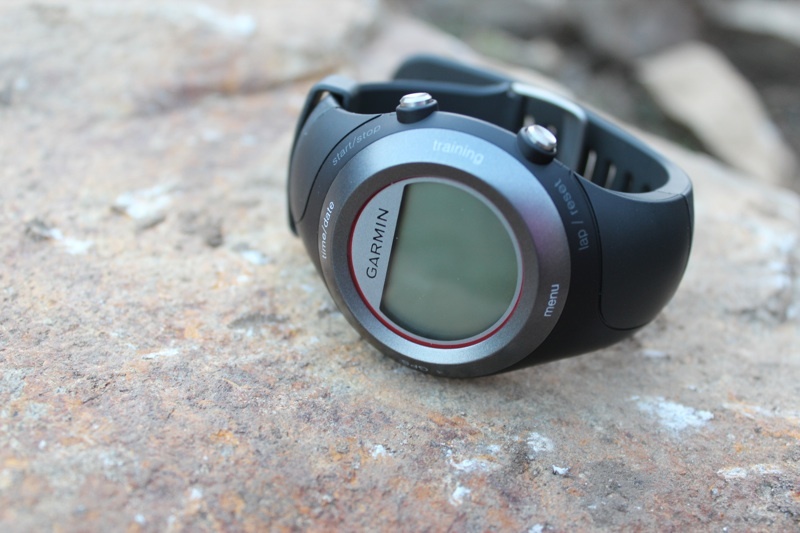 However it falls flat on its face at times, but generally Garmin have made a good stab at it. The touch sensitive bezel allows the user to quickly scroll through menus in an iPod click wheel like fashion. The bezel also supports multi touch gestures, so to speak. For example a two finger tap triggers the displays backlight. So what kind of data is being recorded on your wrist? How fast you run, how far you've run, how long you've run and the amount of calories you've burnt. You can also display your heart rate, if you have the heart rate monitor accessory which wraps around your chest and I have to say, all the info is interesting but the heart rate really is fascinating. Over time you can see yourself running further but your heart rate dropping because your body is more able as you build stamina. Where this watch really shines is the fact it has an inbuilt GPS. The GPS is very accurate and the signal I receive is strong, even when running through very sheltered areas such as under tree branches. This allows you to race against a virtual trainer or against your best results on routes. The routes are mapped out by you and the Forerunner 410 remembers it and guides you to the start of any particular route when you next attempt it. The accuracy that is seen within this function really shows how GPS can be used to enable a real challenge. This adds a new layer to running, for instance if you overstep the beginning of a route the watch will alert and ask you to step back. Those who do want to take this one step further should check out Garmin Connect, an application that shows things like satellite maps of precisely where you've ran and the services syncs data. Unfortunately at the present time it's a little buggy and isn't essential. 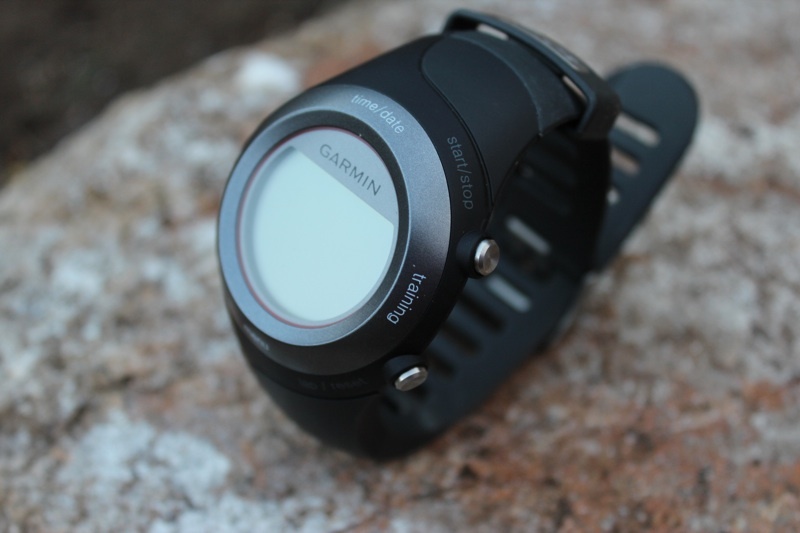 Overall the Garmin Forerunner 410 is definitely for those who take running seriously. With the bucket load of features that actually work well and really help improve the runner, this could be an ideal purchase. It also displays the time pretty well too.